Some hoteliers are now concerned that, if the number of tourists does not keep up with the industry’s accelerated expansion, the market will be so fragmented many will go out of business. A small group of entrepreneurs with close ties to the Government recently made formal representation to the authorities, informed sources said. They had warned that an oversupply of rooms could result in price wars and, for some, even bankruptcy. The sources did not want the members of the group identified. There are at present 1,465 registered “accommodation establishments” in the country with a total of 26,707 rooms. These include 14 five star, 18 four star and 14 three star hotels, multiple guesthouses, villas, bungalows and home-stay facilities. Another 52 new hotels with 2,851 rooms will be opened this year; 18 with 1,554 rooms in 2015; and five with 901 rooms in 2016. Sri Lanka Tourism Development Authority (SLTDA) officials initially refused to release a list of new hotels with locations and names of investors saying these details were confidential. Everything from undefined privacy laws to ethics was cited. A complaint among all industry players and analysts interviewed for this article was that the Government withheld data about hotels under construction or in the pipeline, along with star class, location and number of rooms. “It has been virtually impossible to obtain any information from SLTDA regarding the details of these new hotel developments,” Srilal Miththapala, an industry expert, wrote in a recent column. The lists were eventually given to the Sunday Times on the instructions of Economic Development Minister Basil Rajapaksa, who holds the tourism portfolio. 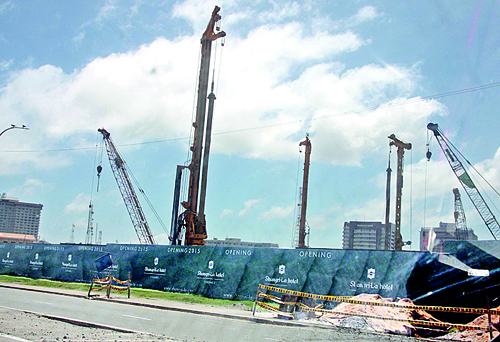 Details of hotels already under constructions are reproduced with this article. Where hotel names are not available, investors have been specified. The Sunday Times also has a list of projects that have received approval. 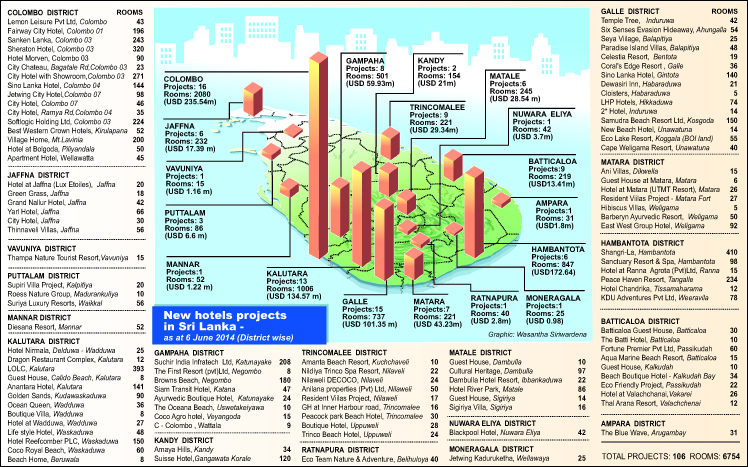 Colombo will have the highest number of new hotels. Sixteen of them are in various stages of construction and will soon add 2,080 rooms to the city, according to SLTDA statistics. Industry unions like the Colombo City Tourist Hotels Association (CCTHA) welcome growth. But they insist that the Government must continue to decree a floor price in Colombo to prevent undercutting. This has become doubly important with the rapid boost in city hotels, they say. Minimum rates were introduced five years ago after city hotels started slashing prices dramatically in a battle for post-war business. But the industry has always been strongly divided about their usefulness. The opposing lobby says the market is now mature enough to lose the “nanny”. There is renewed pressure for price regulation to be lifted in favour of supply-and-demand. Minister Rajapaksa did not answer directly when asked whether the Government would stop regulating prices in the city. He said minimum rates had been brought in because pervasive undercutting had made it a requirement at the time. Opinion is also divided on whether the substantial increase in the number of hotels will benefit or hinder operators. There was consensus that those who did not keep up with modern trends, enhance service standards and improve facilities will lose out. There was also agreement that, in a free market economy, this was something to adjust to rather than complain about. Hoteliers must come up with creative ideas and provide value for money, Mr. Wahab said. Professionally-run operations will be sorted from the badly-run operations. “It happens in most places,” he pointed out. Mr. Wahab did not see cause for immediate concern because, at the current tempo, the Government will not reach its target of doubling hotel rooms to 45,000 by 2016. This will give hoteliers time to sit back and take stock. The Sri Lanka Tourism Promotion Bureau (SLTPB), of which Mr. Kariyawasam is a member, is on an “aggressive” marketing drive. For the first time, the country is being advertised on international television channels like Al Jazeera and CNN. Particular effort is being made to woo the Chinese market. More airlines are coming in. There will soon be charters from China. The new international hotel chains will market the destination along with their properties here. But there are also serious challenges. One is to find suitably trained employees, including those proficient in languages like Korean and Chinese, for the various jobs in the industry. “What the hotel school produces is not enough,” said Mr. Kariyawasam, referring to the Sri Lanka Institute of Tourism and Management. “We need more.” This was a common refrain among all hoteliers. There is a question of what the hotel industry will do with their increased capacity during off-season. Most tourists visit between November and March with the peak being in December. Arrivals dip at other times. The arrivals statistics are also an issue. The Government maintains that they are tabulated on formulae stipulated by the World Tourism Organisation. But there is nobody else crunching the numbers. The private sector is pumping millions into the hotel industry on the basis of data released by a single Government institution.